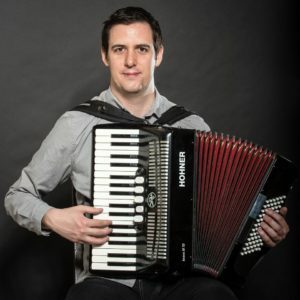 Daev (pronounced Dave) Clysdale (daev.ca) is a Toronto-based musician, who plays piano, accordion, Irish flute and tin whistle. For the last twenty years, Daev has devoted himself to the playing of traditional Irish music, and has become an accomplished performer and teacher on his four main instruments. He can often be seen at traditional Irish sessions in Dora Keogh Irish pub, accompanying fiddler Patrick Ourceau on piano or flute. He also frequently plays for traditional dance events in the Toronto area. He has traveled throughout Ireland extensively, and in 2013 he competed in the Mid-Atlantic Fleadh in New York, placing second in the whistle and piano competitions. Since 2013, Daev has performed with popular Celtic fusion group Rant Maggie Rant, touring all over Canada, and recording on their album Latitude. He has also recorded with Emm Gryner and Trent Severn. In addition to playing Irish music, Daev plays music from other folk traditions: Scottish, French, Breton, Canadian, and more. Daev studied classical music extensively, earning a Bachelor of Music degree from Carleton University in 2004. In 2015, he featured with the North Bay Symphony as a composer and soloist. Since 2016 he has worked regularly as a piano accompanist for the Jumblies Ground Floor Choir. Daev teaches private lessons in Toronto, and has taught workshops at the Chris Langan Irish Music Weekend and the Almonte Celtfest. He is excited to join the team at AlgomaTrad for the second year.